← UK’s Home Minister: White supremacists hate Jews! Israel: Jordan’s King is not a friend! On October 30, 2016, Dr. Edy Cohen in an Op-Post at Netanyahu’s Likud party mouthpiece, The Jerusalem Post, whined that Jordanian King Abdullah II threw Israel under bus at the UNESCO by voting in favor of the resolution which claimed that Jews occupying Palestine have no historic link with Old Jerusalem city. Cohen accused King Abdullah II of repeating Henry Kissinger’s 2012 prediction that Israel is doomed for mistreating Palestinians. Cohen also accused Jordan’s King of sponsoring the so-called “knife attacks” on peaceful Jewish settlers. Last year, the veteran British Jewish MP Sir Gerald Kaufman accused the Zionist regime of fabricating the knife terror on Israeli civilians by Palestinian youth. He also accused the ruling Tory party of working for the “Jewish money”. Cohen warned Jordan’s King to stop hating Israel and Jews before there is regime change in Amman. “We must realize King Abdullah II is fragile and could fall, and we must seek our own security and interest by making sure the next regime in Jordan is our friend. We cannot keep fantasizing about a good king next door, and to those who keep indulging in such fantasy: wake up, the king next door is shamelessly anti-Israel,” Cohen said. Edy Cohen is not an ordinary Israeli Jew. He is author of a new book, The Mufti and the Jews: Haj Amin al-Husseini’s Secret War Against World Jewry, in which he would document more stories about Palestinian Mufti which were missed by Netanyahu last year. Jordan and Egypt are the only two Arab governments which have made peace with the Jew invaders against the wishes of their Muslim and Christian citizens. It’s not due some strategic gains but military bribes from Washington. Egypt receives $1.3 billion military aid annually as compared to $3.1 billion military aid the Israel Occupation Force (IOF) receives from Washington since 1970s. From 2017 on, the IOF will receive $3.8 billion + annual military aid while aid to Egypt would remain frozen at $1.3 billion. Jordan receives $350 to $400 millions total annual aid to keep peace along the Jordan-Israel borders. The Palestinian natives who were terrorized and uprooted by invading European Jewish militants in 1948, make majority of Jordanian population. Since then, a great majority of them are not treated as citizen of Hashemite Kingdom created in 1921 by UK’s Crypto-Jew prime minister Sir Winston Churchill out of British mandate Ottoman Syria. King Abdullah’s father King Hussein was the most popular Arab leaders among the Israeli Jews. His funeral was attended by Shimon Peres, Benjamin Netanyahu, several cabinet ministers and political leaders in 1999. Last year, professor Yoram Meital, head of the Herzog Center for Middle East studies at Ben Gurion University, said that Benjamin Netanyahu considers King Abdullah II a better partner than PA president Mahmoud Abbas . “King Abdullah has no trust, no confidence, in Netanyahu because he does not commit to what he says,” said Meital. 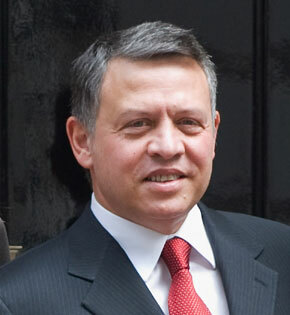 Of course King Abdullah II is not a friend. He couldn’t if he wanted to be one because Israel is not seeking friends, only servants. The king is a servant but from time to time he gives himself delusions of independence by making some timid gesture of defiance. The Jews don’t accept uppity servants. If a rap on the knuckles does not suffice to bring him in line they can arrange a color revolution to replace him with a “friend” of Israel, one who doesn’t step over the chalk line they draw around him.